Colin Kennedy has returned for his third year as a Sapling and is one of the most valuable sailors on the Oakcliff team. Colin Kennedy grew up sailing on Long Island Sound. Ten years ago he began sailing Optis at Port Washington Yacht Club and transitioned to the larger Laser class in 2008. 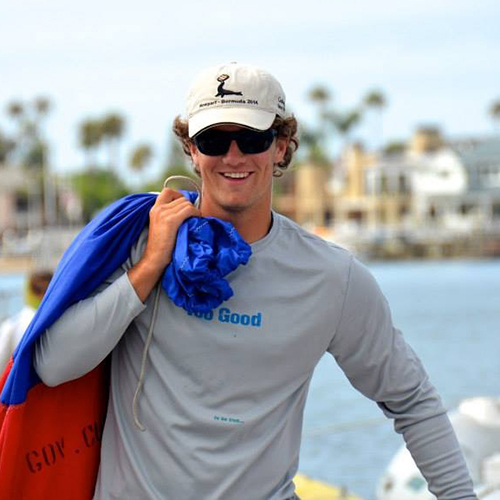 During his Laser career he sailed in sail 2 world championships, 3 US Youth Championships, 1 US Men’s Laser Championship, Miami Olympic Classes Regatta, and 2 High School Singlehanded Nationals. This past year, he completed his first year at George Washington University sailing but also studying to become a Mechanical Engineer. At Oakcliff, Colin was the youngest Sapling in 2013 and is back in 2014 focusing on match racing. He won second place at the Oakcliff Youth Clinegatta 2013 and is looking for the gold in 2014. In the future he wants win the College Match Racing Championships and eventually graduate to the World Match Racing. Colin is very excited to be back at Oakcliff and is looking forward to everything the Sapling program has to offer from match racing to sailing the Olympic catamarans the Nacra 17 sailing.